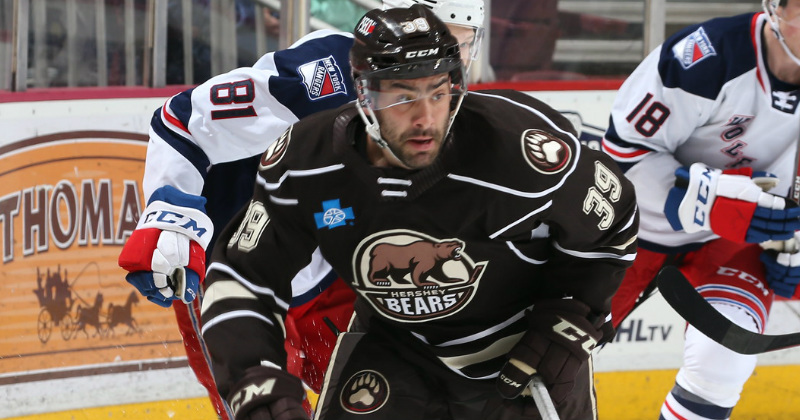 04/14/2019 - The Hershey Bears concluded the 2018-19 regular season on a high note with a 3-1 win over the Hartford Wolf Pack on Sunday night at Giant Center. Joey Leach scored his first career American Hockey League goal in the second period, and it stood as the eventual game-winner. Hershey concludes the regular season with a final record of 43-25-4-4, and complete a 6-0-0-0 sweep of their season series over the Hartford Wolf Pack. Only 32 seconds into the game and before fans could open their popcorn, Hartford tallied first to grab a 1-0 advantage. Darren Raddysh scored unassisted on Ilya Samsonov to put the Wolf Pack in front. The Bears drew even at 11:09 after executing a perfect transition into the offensive zone. After creating a turnover in the Hershey zone, Connor Hobbs moved north with the puck and found Joe Snively on an outlet pass. Along the left wing, Shane Gersich sent a feed to Chris McCarthy in the high-slot, and he beat Hartford goaltender Adam Huska with a laser, low to the ice. McCarthy's tally is his first as a Bear, and first in the AHL since Mar. 8, 2017 with the Lehigh Valley Phantoms against Wilkes-Barre/Scranton. Shots after 20 minutes were 8-7 Wolf Pack with the score tied 1-1. Next period, Leach scored his first career AHL goal at the 5:04 mark. Leach fired a slap shot from the center point which deflected on route and into the cage in his 64th career AHL game. Hershey carried a 2-1 lead into the third period, in addition to leading in shots 18-16. Into the third, Snively added an empty net goal at 18:34 to complete a 3-1 final. Samsonov stopped 23 of 24 shots to earn his 20th win of the season in goal. The Bears finish the season as one of two teams in the AHL with two, 20 win goaltenders. The 2018-19 season marks the first time the Chocolate and White have two 20 win goaltenders since 2007-08 (Freddy Cassivi and Daren Machesney). The Hershey Bears will return to the 2019 Calder Cup Playoffs and battle the Bridgeport Sound Tigers in a Best-of-Five series beginning on Apr. 19 in Bridgeport for Game 1. Tickets available for Game 3 and if necessary, Game 4 will go on sale at the Giant Center box office on Tuesday, Apr. 16 at 10 a.m. Ticket information is available online at HersheyBears.com.